The two men came through the stable gate, each of them leading a horse. The narrow, one-lane street outside the stable was lined with people who sat in chairs on the sidewalk, or on the steps of houses with boarded-up windows. There was a steady flow of people walking down the block to the open-air drug market just around the corner. The younger of the men easily mounted his horse, but the older man struggled to raise himself up on the stirrup. The catcalls were loud: Get up there, old man. Don't fall off, old man. Or just: old man! The man edged himself up, belly sliding over the saddle, until he was sitting up and ready to ride. We're going this way, he told me, and they were off. I ran for my car to follow after them as they rode down the streets. Every few blocks they'd pull over to let me pass, and when I was some distance in front of them I'd jump out of the car ready to take pictures. And then they'd ride by, and I'd get in the car and follow after them, and we'd repeat the process. They rode up to a group of men standing outside on their lunch break. This is not something you see every day, one of the men said, and out came the cell phones. 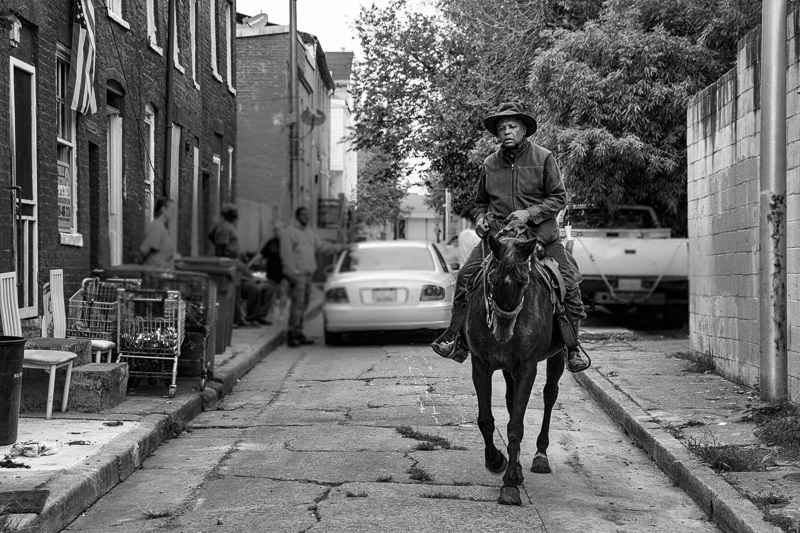 They rode on - these two urban cowboys - and for an hour or two all troubles were forgotten, and the world was a place where it was possible to be perfectly happy and in control of one's destiny. And finally they were tired of waiting for me, and left me standing by the curb as they rode off under a gray Baltimore sky.